I'm getting back into art again so I'm trying to round out my portfolio a little. I noticed I don't have any trees yet. So here goes. You may notice the picture flip, that's because it helps me spot any obvious flaws. It's been so long I forgot the basic process and put way too many colors down at first. On this next one I simplified the colors so I could see what I was doing, then built up from there. And that's where I am so far. I actually really like the amount of colours that were present in the first attempt. It gives it a really unique and impressionistic style - it makes it stand out and have a real personal flair to it. 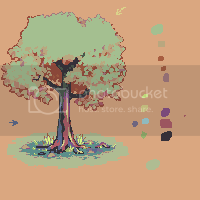 I think this is a case where I might encourage you to stick with your original, broader palettes. That's really a fairly personal opinion, so it might be one you discard. The trunk in the second edit is definitely formed better, and the shading feels more natural. Well I'm planning to add a few more colors later, but the way I had it was just too confusing for me to work with right now. Struggling pretty hard with this. Those leaves are a pain in the arse. But I think I've got something that should look right when finished. I fixed the perspective a bit. Added some grass and stones. What do you guys think of the grass? What about the leaves? 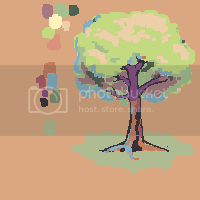 Gave it a little more form with the bright colored leaves, blended the trunk into the leaf contrast better to make it uniform, shaped some leaves to give the tree a bit more sense of clear form while maintaining the 'impressionist' sense you were going for. The grass is still a bit too bright imo, but it works to balance the image contrast as long as there isn't too much of it. Also, I personally would advise against adding more colors and going with the ones you have here. They are chosen fairly well and work together nicely. 1) Unless you're going for a /really/ abstract or digital look, I'd advise against going for really squared-looking leaves -- impressionists did use blending to smooth their forms in some places. 2) Your line-work is really nice, but I suggest either going for a fully drawn look or a fully silhouetted look -- the latter is more useful for painterly-looking styles like this one (and by 'silhouetted', I mean start with a flat-color-filled silhouette and work in your shadows and highlights from there for form instead of drawing nice lines as you might for larger, but more "specifically-detailed", structures or characters, since removing those lines on such randomized details is a lot more work and tedium in the longrun than simply not having them there at all to start with). 3) The variation in outline color periodically across the image's edge really makes the form look too chaotically 'outlined' and lends nothing to the 3d form of the image, so I suggest only using the shadow color around the edges to hint at more leaves along the edges, on different 'layers', instead of using the darkest colors just for the sake of separating the subject from the canvas color. 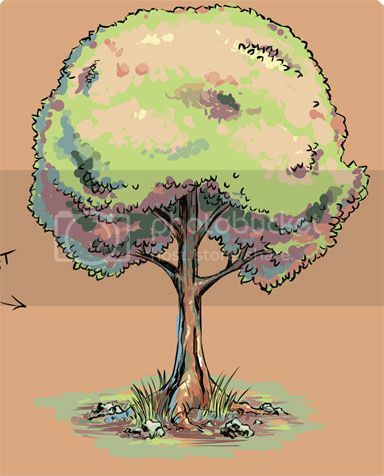 I didn't fix this issue much in my edit except for the bottom portion on the shaded side of the tree leaves and some along the left and right sides of the leaves, but I did that to give you a clearer idea as to what I'm talking about so you can get a sense of how to apply it to the more lit portion of the tree. Anyway, that's all I've got for now. Your drawing looks great btw -- I just thought you might be going too much for a 'concept-art' look than you probably really wanted to, so I addressed that in my edit a bit. Hopefully that helps. Oh, I made an edit a little while ago and didn't bother to post it. Maybe it'll be useful, but it's nothing like the style you seem to be going for. Main things were contrast and highlights yeah. @astraldata the square leaves were made by a square brush but I meant to round them out. Hopefully I fixed that problem in my latest edit. The outlining was very incomplete in the last post, hopefully it looks a lot better in this one. @Ambivorous I like the idea of the dark green shadow on the top of the trunk and I've emulated that in my latest version. 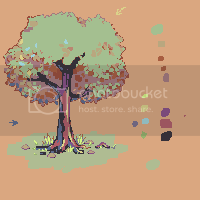 Added a shadow under the tree and totally reworked the leaves. Instead of trying to draw individual leaves I just went for the chaotic bulk look. Also at the risk of offending some purists I outlined the leaves really thick in some places. Personally I like the look, but I'm open to other opinions. I'm holding off on the highlights on the leaves until later. It's possible those grass blades are too strong. It's still rough but what do you guys think so far? 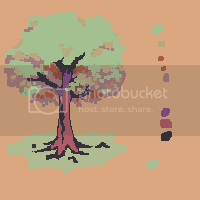 Ok I cleaned up a lot of stuff and tried to make the bark look more like real bark. Also added the highlights on the leaves. I'm thinking of calling this done now. Opinions? I don't think your highlights are clumped enough. Refer to my previous edit for what I mean. You should be using them to define the bushes near the top of the tree more I feel. I'd also like more contrast in the leaves, but this could literally just be a matter of paint bucketing (darker shade for the underside of the leaves, lighter for the hightlights). I really like what you've done with the trunk and grass, though perhaps the right side of your trunk is now a little too dark? I'll make an edit when I get home this evening to show you what I mean with everything. I didn't increase the brightness of the highlights for reasons. You can call this done if you want though. It's certainly pretty and appealing. Will be saving it to my inspirational pieces. Highlights aren't clumped enough? Well I'm not how good it would look if I did that actually, if you make things too contrasted / defined I find the image loses focus This was one of the problems when I was working on the leaves, and why I chose to go for a lower contrast / less defined look. I appreciate the other comments and the edit and I'm taking note of these things for the next time. Unfortunately I don't have the time to mess with this anymore since I have to start on another project.